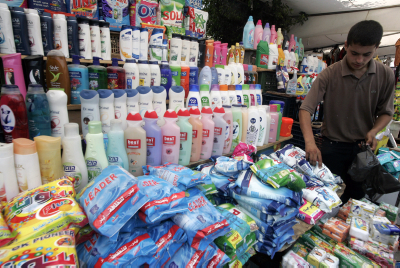 After meat, cheese, cellphones and other consumer products that various government ministries have acted upon in recent months in order to reduce prices, the Economy Ministry said that it was taking aim at importers of toiletries, cosmetics and other beauty and personal care products – who were charging Israelis often far more than they were charging residents of other countries. In a wide-ranging study, the Ministry compared the price of health and beauty products – from perfume down to antiperspirant – and discovered that the price in Israel for many of them was often the highest in the 12 EU countries included in the study. That was true even when the 18-percent Value Added sales tax (VAT) was removed from the equation. VAT is automatically included in the price Israelis pay on many consumer items, and often an excuse for the higher prices on many consumer goods, according to importers. A large part of the problem is that there is no free market for many of the toiletries included in the study; many are imported by a single source, making them the “sole importer” of a product. With no effective competition on a specific product, any one retailer selling many of these products was able to charge high prices for the product. As a result of the study, Economy Ministry officials will meet with several of the importers in order to present the data, and to formulate policy on how to lower prices. Officials said that they hoped importers would get the message and act accordingly, instead of failing to do so and forcing the Ministry to act.